Tag line: "History is made at night"
The third in a trilogy, 1998’s The Last Days of Disco is nonetheless the only Whit Stillman film I’ve seen thus far (this movie, as well as 1990’s Metropolitan and 1994's Barcelona, make up what has been deemed the writer / director’s “Doomed Bourgeois in Love” series). And based on what Stillman accomplished with this movie, which features complex, well-rounded characters that are not nearly as mature as they think, it looks as if I’ve been missing out on something special. By day, college graduates Alice (Chloë Sevigny) and Charlotte (Kate Beckinsale) work as proofreaders for a prestigious New York publishing company. But when the sun goes down, these two best friends head to New York’s hottest nightclub, where disco music fills the air and many of the city’s most eligible bachelors hang out. Alice, in particular, has the hots for two guys: Tom (Robert Sean Leonard), a lawyer who recently separated from his longtime girlfriend; and Jimmy (Mackenzie Astin), a junior executive at an advertising firm. Part of Jimmy’s job (as least how he sees it) is to usher his company’s clients to the nightclub and show them a good time. Yet even though he’s friends with Des (Chris Eigeman), one of the club’s managers, Jimmy has been barred by the owner, Bernie (David Thornton), who dislikes people in advertising. Realizing his pal could lose his job, Des continues to sneak Jimmy into the club but learns he himself may be unemployed soon when Josh (Matt Keeslar), an assistant District Attorney, tells Des that Bernie and his nightclub are being investigated for tax evasion and other illegal activities. 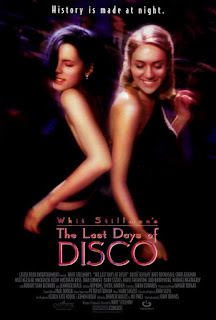 Set in the early 1980s, The Last Days of Disco has a great soundtrack that includes some of the period’s biggest hits (“Le Freak” by Chic, “Turn the Beat Around” by Vicki Sue Robinson, Blondie’s “Heart of Glass”, and that perennial disco classic, Alicia Bridges’ “I Love the Nightlife”), and as a result the nightclub scenes have an undeniable energy. But more than a simple homage to a bygone era, The Last Days of Disco is an engrossing character study, throwing the spotlight on a group of well-to-do people who are ultimately very selfish. Chloe Sevigny delivers an incredibly nuanced performance as Alice, the most down-to-earth of the bunch, who often wonders (along with the rest of us) why she remains friends with the shallow, occasionally cruel Charlotte (much of the so-called “advice” that Charlotte gives Alice, from how to talk to guys to what books they should recommend at work, usually leads to disaster). From early on, it’s clear that Charlotte, played quite well by Beckinsale (in her first American role), is jealous of Alice’s potential, and we sense from the get-go that their friendship isn’t going to last. Not to be outdone, the male characters in The Last Days of Disco are every bit as self-serving as Charlotte. Tom does eventually hook up with Alice, only to spring the news that he’s reuniting with his girlfriend (but not before giving Alice a going-away present: a venereal disease). Jimmy, who lives in fear of being fired, has no problem putting his buddy Des’s job in jeopardy; at one point, Jimmy and two of his clients don Halloween costumes and sneak into the club. As for Des, he’s a drug addict who dumps women by telling them he’s gay, and while he’s clearly intelligent (his opinions on “Yuppies”, or “Young, upwardly-mobile professionals”, are thought-provoking), he’s also an habitual liar, and has been known to do some very stupid things (he rarely hides the fact he’s using drugs). Josh, who suffered a mental breakdown a few years prior, is more mature than the other guys, yet fails to act when he develops feelings for Alice, choosing instead to sit back and watch as she dates a series of men (including a brief tryst with Des) who aren’t good for her. Across the board, the performances in The Last Days of Disco are top-notch, but it’s Stillman’s script that brings these flawed men and women so convincingly to life.